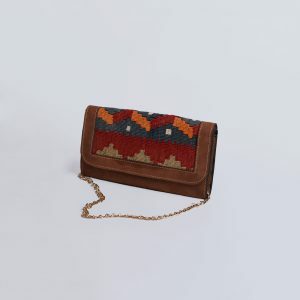 Hand-made from genuine Persian Kilim and suede leather, this stylish Ella clutch beautifully combines form and function, earthiness and elegance. And with its unique vintage-looking design, it will complement your day or night outfit—the perfect bag for going out! Made of Persian vintage Kilim and dark green genuine leather, this Ella clutch is the perfect bag to complete your day or night outfit. Stylish and unique.